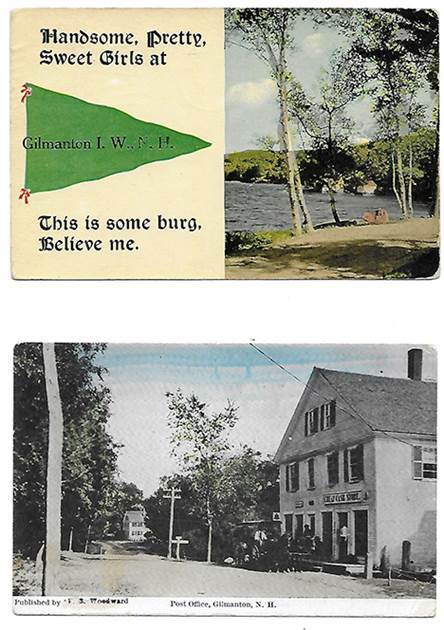 Gilmanton in Postcards will be featured at the Gilmanton Historical Society’s program on Tuesday, August 28, 7:30 pm. Postcards became very popular during the late 1800s and early 1900s. The Gilmanton Historical Society has more than 300 early postcards of Gilmanton scenes in its extensive collection. On Tuesday evening, August 28 at 7:30, Society President John Dickey will present a program showing these beautiful postcards, some with very interesting messages written on them. The program takes place at Old Town Hall on Route 140 in Gilmanton Iron Works. For more information contact John Dickey at 267-6098. Social hour and refreshments begin at 7 pm and the program begins promptly at 7:30. The Society’s museum, in the basement of Old Town Hall, will be open at 7 pm. The final program in the Historical Society’s 2018 summer series, on September 25th, brings Steve Blunt performing as John Hutchinson with Songs and Stories of the Hutchinson Family Singers. The Society’s Museum in Old Town Hall is open every Saturday morning, 10 am to noon, June, July and August. The programs are free and open to the public. Donations to support the work of the Society are always welcome.